Sandy Ground, Anguilla - Roy's Bayside Grill - Our view. 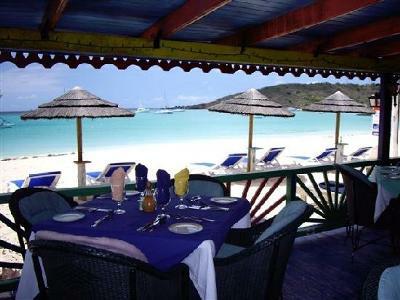 Sandy Ground, Anguilla - Roy's Bayside Grill - Our location, so you can find us! Specialties: Lobster Bisque, Roy's Fish & Chips, Sunday Roast Beef with Yorkshire Puddings and the works! We have been to Anguilla twice. 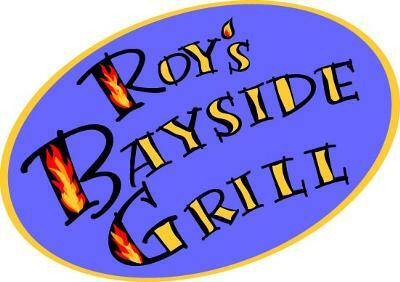 The first time there we quite literally came across Roy's Bayside Grill by mistake, but thoroughly enjoyed our lunch and the conversation we had with Roy's wife Mandy. She was wonderfully helpful in orientating to the island and openly recommended other restaurants to visit, all of which were very good. We went back for dinner on our last night that trip and vowed to return. We kept our promise and went back last year and this time our first stop was Roy's. Mandy remembered us from two years earlier and we were welcomed back like family. We had several meals at Roy's last year. Every thing we ate at Roy's was delicious, but the Fish & Chips were hands down the best we have ever had - anywhere. I hounded Roy for the recipe, but he refused to divulge his secret. Anguilla is a great vacation island and Roy's is one of several really great dining experiences there. We've been to Roy's a few times and love it! They have great food and an excellent Happy Hour on Friday nights and a full roast on Sundays. We love Anguilla and have been scuba diving with Dougie out of Sandy Ground, sorry the company name escapes me. Dougie was the first Anguillian born Dive Master and has been diving since 14. He is a great guide and knows all the sites in-side-out!